D.C. was one of those trips that was filled with really excellent moments–you know, those moments where you think, damn, that was weird, but then keep going and don’t think about it too much. I was able to catch up with old friends (more to come later! ), be surrounded by ten hundred million writers (ok, well, a few thousand at least), and not really sleep for a few days & get supremely drunk many nights (which always makes things a little more interesting), but among other things, I also ate not one but two fantastic veggie burgers (something I haven’t experienced in eons since moving to smaller town America). The first veggie burger was my first DC eat, actually, and was a lunch we grabbed right after we got into the city. We arrived an hour or so before registration, so instead of hanging awkwardly around the hotel, we opted to drive down to Dupont Circle and find some lunch. After browsing a bookstore (new books, none we could really afford, of course), we trotted across the street to BGR, The Burger Joint. Although the space was decorated in some strange 80s flashback rock n’ pop culture theme and the Coke machine was a thing of the future with a computer screen and far too many options for me to feel comfortable with (seriously, computers + pop = freaky combo), the burgers left nothing to be questioned or desired. I opted for the veggie burger lunch box which came with fries and a drink, but I upgraded the fries to the “Green Standard,” something the menu called “asparagus fries,” but which actually turned out to be grilled asparagus with parmesan sprinkled on top. Not that I’m opposed to grilled asparagus, but I was really hoping the asparagus would be deep fried and all bad for you. On the other hand, the veggie burger was the best I’ve ever had. EVER. The mixture is described on the menu as containing brown rice, beans, oats, and molasses, and it was completely non-mushy with a good chewy/solid texture, and slightly dark-sweet due to the molasses. Something about it just worked, and the sweetness was really no more than BBQ sauce–tangy and sweet and savory all at the same time. Plus this thing was a monster. I really think it helped keep me mostly sober later on that evening when I was 4 whiskeys into the night. 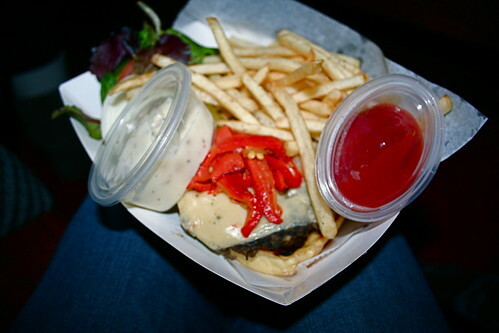 The second veggie burger came courtesy of the Rock and Roll Hotel and was not only half price (that’s right, $5!!!) but was half price due to the amazingness that is the club’s WTF Wednesday’s: three (yes, three!) 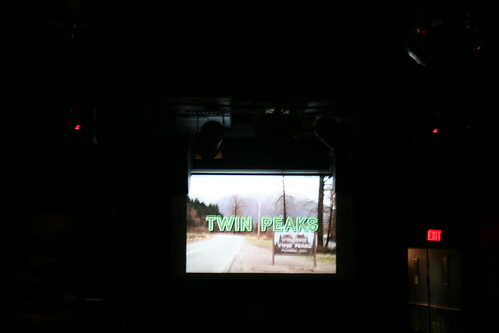 episodes of Twin Peaks, $3 well drinks, and 1/2 price burgers (including the veggie burger). Yes, yes, and yes. 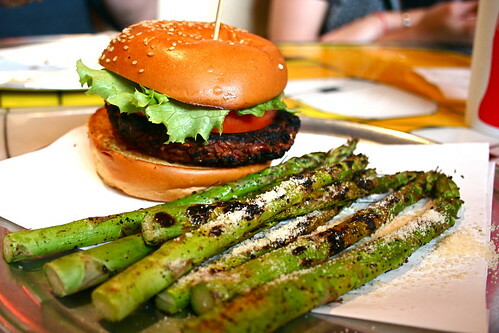 Ok, that first veggie burger looks incredible. I’m making a mental note in case I ever make it back to DC (which is very possible, although I think I will have to do some serious negotiating to choose a restaurant when I go). I like fried asparagus – I think I’ve only had it as tempura – but can you imagine what people who don’t like veggies would think when ordering asparagus fries? Oh my. Twin Peak! Asparagus fries! It all sounds fabulous! My mouth is watering reading about these. oh yum! I haven’t been to DC in years..this makes me want to go back. Veggie burgers are one of the few things I never order when eating out… I just typically don’t think of them as being special. Good to know that there are some worthwhile offerings though!